The rescue operation began after a call from the Mumbai Coast Guard about rising water level in the Idukki dam area, Lt Col Shashikant Waghmode said. From flood-ravaged Kerala comes a story of grit of the Coast Guard and armed forces personnel who saved a newly-born baby in a night-long rescue operation near the Idukki dam two days ago. 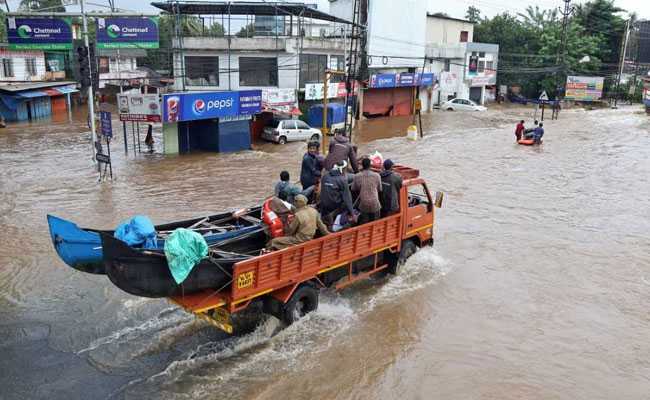 The rescue operation began after a call from the Mumbai Coast Guard about rising water level in the Idukki dam area, the Army officer, who led the team, said. "We were in the weekly commanders conference at Kochi when a call came from the Coast Guard office in Mumbai to send the best team near the dam where water was flowing above the danger level," Lt Col Shashikant Waghmode said. Lt Col Waghmode, an assault engineer officer currently on deputation to the Coast Guard, volunteered to lead the team and within 30 minutes, the team members were selected. Many Coast Guard personnel were called from various ships, he told PTI when asked about the operation. They were equipped with boats, outboard motor, ropes, digging tools, survival ration and medical kits, he said. "After the briefing by District Commander DHQ-4 DIG Sanathan Jena, the team, comprising 16 Coast Guard divers, started the journey at night," he said. The terrain was a challenge as Idukki is located in a hilly area, which had a number of landslides. There were waterfalls and poor visibility due to fog. The 'nullahs' (drains) and rivers were overflowing, he said. The team had to cross the Chappat bridge as the dam gates were going to be opened at 4.30 am. "I had taken along drivers experienced in the hilly terrain and after nine hours we managed to cross the bridge at 4 am, half-an-hour before the dam gates opened," said Lt Col Waghmode, an alumnus of the Sainik School at Satara in Maharashtra. In Idukki, they found that all the villages were evacuated and hotels, shops, ATMs and petrol pumps were shut. There was no place to take shelter, he said. For the next four days, the Coast Guard team rescued many people in Manjumala and nearby villages and cleared debris and boulders. "I was leading a peculiar team comprising personnel from the Coast Guard, the Army, the Navy and the Air Force. I was given the best sea divers of the Coast Guard, Navy nursing assistants, vehicle drivers of the Army and the Air Force," he said. "On August 16 night, just as we reached an abandoned government hospital for rest after four days of non-stop work, the local police officer, villagers and NDRF officials came to us, asking to save the life of a woman who had just given birth," he said. The locals told the rescue team that the woman and her five family members were stuck in a flooded house without food and water for four days, he said. The team then launched a night-long rescue mission, calling it "Operation Water Baby", Lt Col Waghmode said. The woman's house was two km from the point where the rescue boat was unloaded, he said. "The best six members of the team were selected and the operation began at 10.30 pm in pitch dark and against the water current," the officer said. The outboard motor was not effective as there were lot of stones, debris and mud mounds below but the team pushed the boat for about 2 km against the water current, which was around 15 knots, he said. The team reached the house, guided by local policemen who accompanied them in the boat, at 1.30 am. "The family was in a bad state. They were not aware that someone was coming to their rescue. Due to medical issues of the newborn baby and the mother, we decided to wait till sunrise and continued the operation early morning with the help of a local doctor," he said. "On our way back, wherever there was less water, we lifted the boat with family members inside it. After we reached a safe spot, the woman told us that she will make her baby boy join the armed forces," the officer said. After this rescue operation, the team was given a choice to return and rest, but the personnel chose to proceed to Chengannur and join another rescue operation, he said.